The background idea for this card came to me in the autumn, as the trees lost their leaves and trunks were the most noticeable part. Some of the cards I printed gave the trees a misty effect. Not intentional, it is due to my inefficient inking, but I rather liked it and it matched the weather we were having at the time. The barn owl is a beauty and one I have occasionally heard calling across valleys, usually when camping, without always knowing what it was. Quite different from the twit twoo of tawny owls! They are not actually woodland creatures, yet the only places I have ever seen them in the wild have been along the edges of woodland, where it opens out to fields. 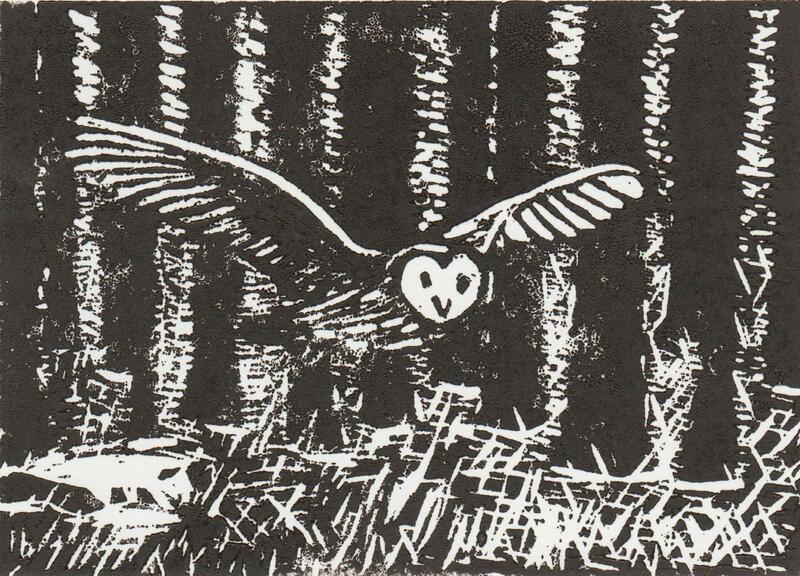 Owls hunt at night, when it is dark to most creatures, as they have excellent eyesight, much better than their prey. They bring the gifts of far-seeing, and seeing what was previously unseen, into our lives. They also have particularly long necks, so can turn their heads to see what is behind them, or sideways. Sometimes it is good to look at things from another angle. Or sometimes there are things we simply haven’t seen and owl will bring them into focus. Illusions and secrets will be seen through. Another gift is silence. Thanks to the shape of their feathers with soft edges, owls can fly with far less noise than most birds. The barn owl is particularly well adapted for silence, as it has very large wings so can fly very slowly with no sound. Instead they will be listening; owl hearing is acute as their ears are not symmetrical, allowing them to pinpoint sounds accurately, while their heart-shaped face directs any sounds towards their ears. Listen beyond the background noise to what is really being said. Unfortunately the payback for soft feathers in Barn owls is a lack of waterproofing. They cannot fly in wet weather, so will sometimes be seen during the day if there have been several wet nights. Take opportunities when they are available, even if it is not what is usually done. There are many superstitions about owls, especially the barn owl, appearing silently as a ghostly-white apparition in the moonlight. The most common is that they foretell a death. Given the huge numbers of mice and other small animals they must catch each night to feed their family, that is certainly true! Spiritually however, death is often close to change as it usually means the end of something in our lives, ready for something new. Owl does often seem to bring this message, often also bringing an increase of intuition helping to smooth the change. The Celts believed owls sometimes accompanied souls on their journey to the other side, and owls were often regarded as gatekeepers to other realms. It was the Autumn Equinox last Sunday, a time of harvest celebrations. But what a strange year this has been! A late winter with snow in April, then drought in May, June and July, before a wet and chilly August. The apples loved it. The extra cold helped them create more flower buds, they survived the drought, losing excess fruit without me having to thin them out, and then the rain came just in time to help the fruit swell. The first fruits were ready at the start of August, two weeks early even for our early trees, and carried on into September with larger fruit. I spent the days before we went on holiday (late August) madly making apple sauce to freeze, as this early fruit doesn’t keep and we were overflowing with apples on every counter. Plums came at their normal time, but suffered from being eaten more than normal. The apples also had lots of wasps early on which I’ve never seen before, I assume there just wasn’t much else for them in the drought. Blackberries came a month early – but with the cold weather finished early as well. Yet my strawberries have had a second crop and been a really delicious treat – they are still going. The raspberries cropped well in the drought but didn’t make new canes, so the autumn crop and also next summer’s are greatly reduced, even though there is plenty of rain now. In the vegetable garden, the sweetcorn drank all the water offered so underplantings (mainly nasturtiums) all died. I had a crazy plant with a cob growing around a male flower, but it proved edible and we managed a small crop of good cobs as well. The climbing French beans were so prolific that eventually the wind blew them over. The edging and supports will all need replacing over the winter. Similarly the tomatoes grew so well in the heat I actually had to stop them at the top of their six foot stakes! Finally, one crop I harvested but didn’t grow was barley. I promised myself last year that I would as so many Lughnasadh rituals are based around wheat – which I am allergic to, but barley is fine for me. Unfortunately I never found any small quantities of seed for sale. However, I did keep an eye on the fields around here, and spotted barley growing along a lane I sometimes cycle, with a footpath going conveniently along the edge of the field. With the drought it was harvested in mid-July, earlier than I have seen previously. So I parked up my bike, climbed the style which luckily wasn’t completely overgrown with nettles and brambles thanks to the drought, and walked along the field edge to see what had been left behind. Enough barley, and also some wheat for the rest of the family, to make a display and grind some into bread. A token amount – it takes a lot of grain for a loaf and barley I discovered is much harder to separate from the chaff than wheat, but somehow the inclusion of even a few grains of my own picked and winnowed barley seems worth it and makes the bread special. I have managed to be part of the wheel of the year and the turning of the seasons, not just an observer. 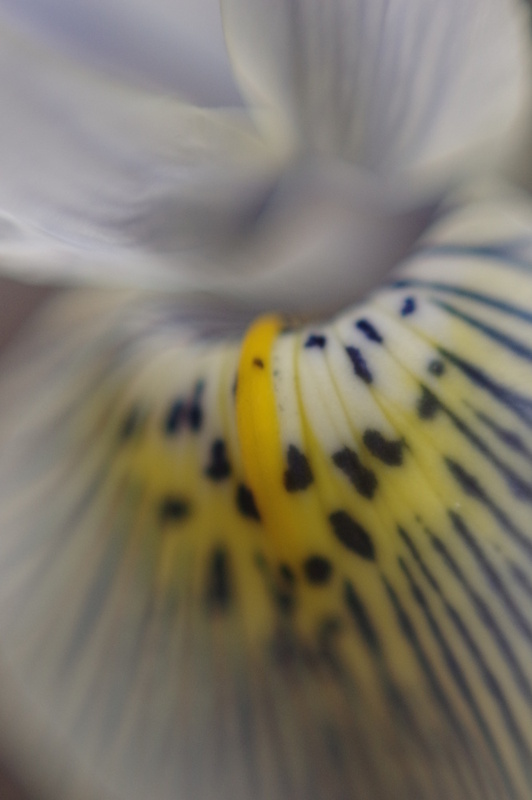 I have been enjoying the flowers of early Spring, which being generally very small, decided it was a good opportunity to experiment taking some ‘close-up’ pictures. I love seeing macro shots, probably because I have poor eyesight and pictures can often show more detail than I can see with my eyes. 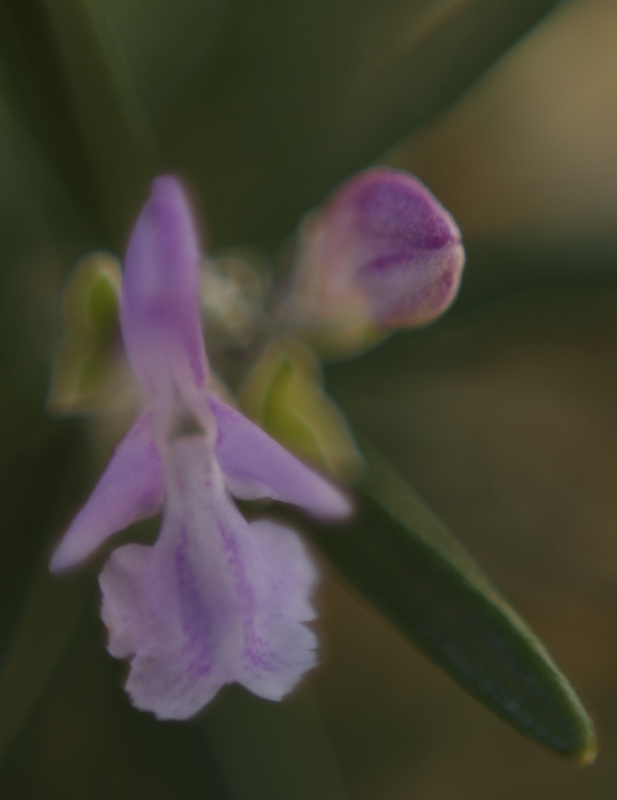 Taking them is a different matter however – my poor eyesight makes it difficult for me to focus accurately, and it has been very windy all week, adding an additional element of luck to whether the flower stays where I have focused. A tripod wouldn’t necessarily help! While watching for snowdrops, I found many Viburnum flowers as well as Hazel catkins swinging in the wind. 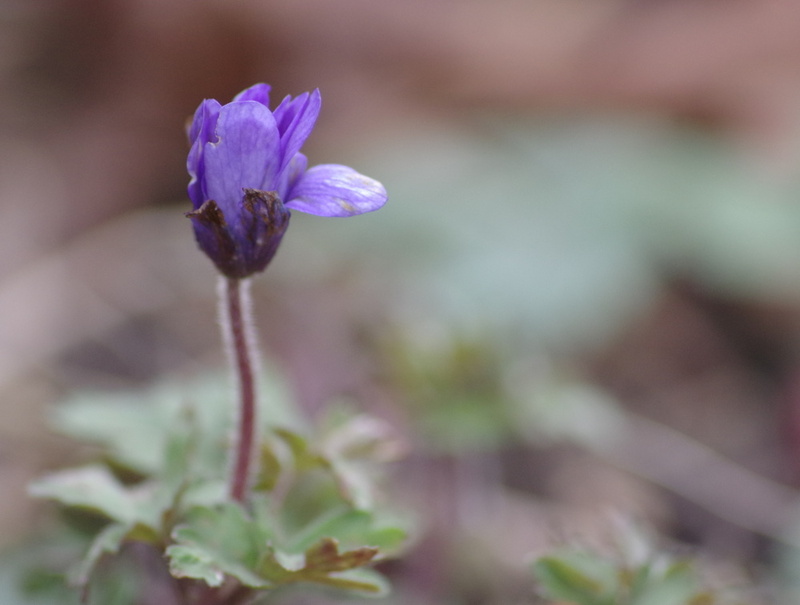 More surprising however were a few purple Anemone blanda just opening up, as well as Rosemary in flower. 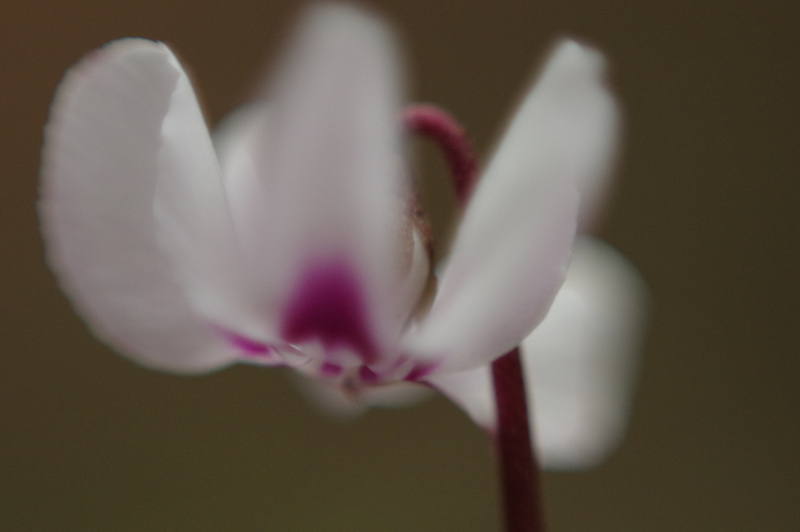 I also found a lone cyclamen flower, which was fun to take from almost underneath, and an Iris reticulata being battered by the wind. 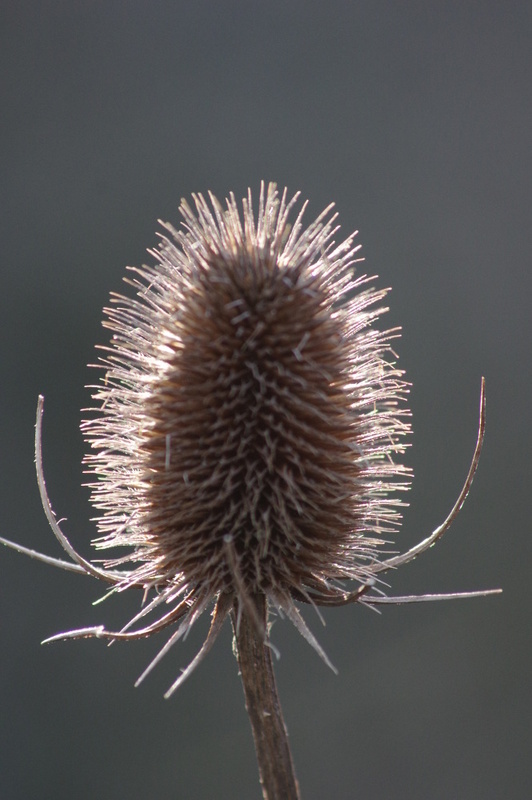 Finally, I noticed some teasels which are long past their flowers but were backlit by the sun and I couldn’t resist. 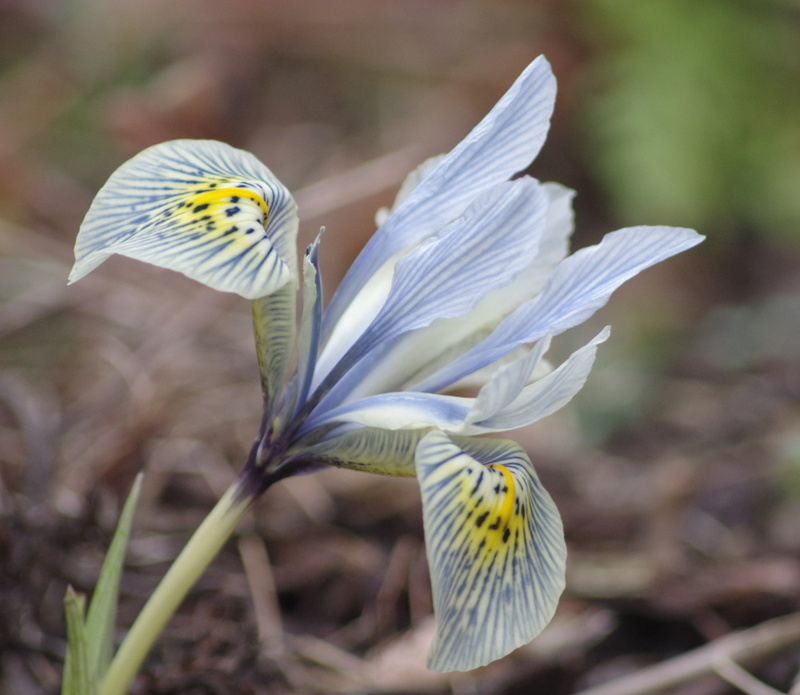 Iris reticulata being blown by the wind. The pictures were all taken with the same Pentax DSLR camera body but two different lenses – a Sigma 70-300mm telephoto on macro setting, giving me a working distance of 1-2m, and a 50-year-old Pentax 50mm lens with a reversing ring and converter ring giving me a working distance of 10cm and almost no depth of field. I’m still exploring its potential now that digital gives me instant results. 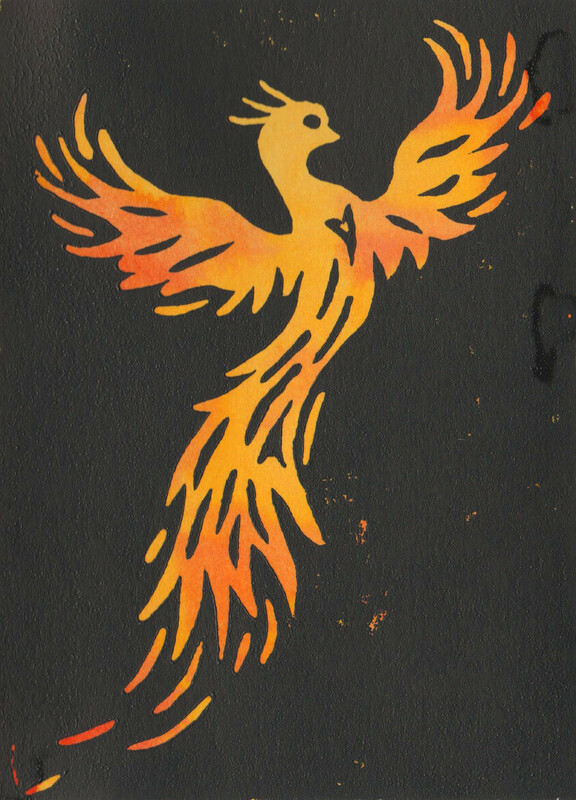 Lughnasadh was on Tuesday this week, a festival I realise I tend to be slightly ambivalent about compared to the other fire festivals of the year. A fairly important family anniversary the day after Lughnasadh may have something to do with that, as well as the fact it normally features the grain harvest as its central message (thanks to its connection and confusion with Lammas, the Christian Loaf Mass) and I am allergic to wheat! However, this year Lughnasadh marked some major unexpected events for me that make me really look forward to the next year (more of which to follow) – so I was feeling puzzled as to why seeds are being madly sown in my life while the rest of the world is apparently at harvest, and wanted to explore some of the meanings of the festival a little deeper. Lughnasadh, also spelt Lughnasa, Lughnasad, Lunasa etc, is an old Irish festival, named for the Celtic sun-God Lugh, and Nasadh meaning an assembly. It didn’t actually celebrate the harvest, which is frequently a little later in August; however, Lughnasadh was started as a result of the start of growing and harvesting crops. Besides, if the assembly was held at harvest time most able-bodied people would have been too busy to compete in any games! When the Tuatha de Danaan invaded Ireland, the High King of the Fir Bolg, Eochaidh mac Eirc was killed in battle. His wife, Tailtiu, was then given a high-born son of the Danaan to raise as her own, as a mark of trust. Fostering children was a common way of creating peace between kingdoms, in the same way as marriage was used. The son she was entrusted with was Lugh. Clearly as a way of inspiring loyalty, this was an inspired choice. Lugh flourished and developed incredible skills and talents, winning the titles Lamfhada, ‘of the long arm’ for his prowess with spear casting, and Samildanach, ‘master of all arts’. He went on to become High King, and was a Druid and a Warrior. He remained very close to his foster mother, despite leaving to seek his fortune, and was devastated when Tailtiu died of exhaustion on 1st August after clearing a great forest on the plains of Brega in readiness for farming. (The Bronze Age had arrived in Ireland.) When the men gathered at her death-bed, she told them to hold funeral games and celebrations in her honour. As long as they were held, she prophesied Ireland would not be without song. This is of course what Lugh did. The first games were held at the town now known as Teltown in County Meath, where they continued to be held until the Norman invasion – and informally in rural areas until the eighteenth century. They were known to include sporting contests in hurling, spear throwing, sword fighting, handball, running, wrestling, boxing, horse and chariot racing, staged battles and displays of Irish martial arts, as well as music, poetry, story-telling, singing and dancing, and competitions amongst craftsmen, such as goldsmiths, jewellers, spinners, weavers, and the forging of weaponry and armour. It was also the time that laws were made and announced to the people by bards, and contracts, politics and alliances were agreed between families. Even weddings or handfastings took place by linking hands through a hole in a stone, which could be dissolved the next year by walking away from each other if it didn’t work out. August remains one of the most popular times of year for weddings. Violence was not tolerated for the period of the festival, all those who came had to agree to a truce. So it was Tailtiu who made the sacrifice so that man could plant corn, offering herself as the divine feminine. She was not afraid to work hard, and was an excellent mother in all senses of the word. Her festival reminds us to look at all our talents, use them, and as well as reaping our harvest, see what we can give back to others, and to the Earth. In that sense I now understand where my new seeds have come from, and what responsibility I have to nurture them and help them grow. To many, and usually me, this is the Pagan New Year. The start of the dark time, just as all the old festivals start with the night and follow with the day. This year, however, I was feeling increasingly confused as Samhain approached, given that the new Sun cycle started in September, and the calendar year doesn’t start until January. How was I to celebrate the middle of three ‘New’ year moments? Was I going to be able to make it special? 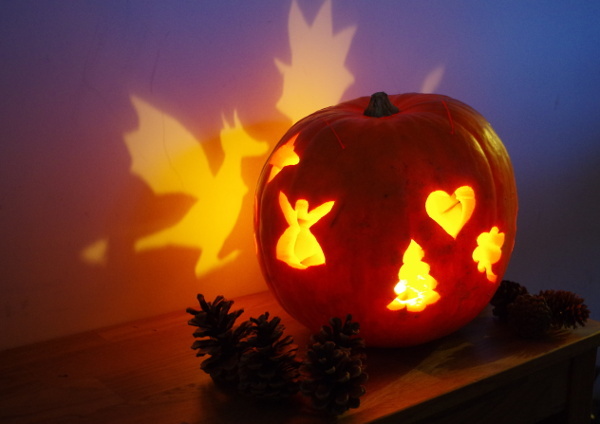 I did the usual preparations, carving a pumpkin with pictures or symbols that were significant to me, some for the past year and some for the coming year. This year M and I chose four animals, one for each element, two seen in the garden and two that exist in other realms. These were frog (water), snake (fire) as we had a brief visit from a grass snake a few days before, dragon (air, in this case) and lynx (earth). All the useful pumpkin flesh that could be removed was cooked and turned into pies and soup, before cutting the designs with my trusty converted hacksaw blade. Then I lit a candle inside, gave my thanks, and waited to see what would come. Well I have never before experienced such a dramatic shift into the dark of the year. The clocks changed making the evenings dark. The season changed, becoming cold and frosty with the remaining leaves making a rapid descent from the trees. The second term of the school year started, bringing new activities at seed stage to hopefully flourish in performance next Spring. But also, something shifted within me changing my path going forwards. The direction I thought I was going in suddenly no longer feels right, yet at the same time other avenues have opened up and feel really positive. I will use the dark to explore this further, make new plans, and gently ease myself out of a lot of attachments I have made over the past few years. Some will be reformed into new relationships, others may not survive. I shall be busy this dark time! This week was the Equinox, when day and night equalise briefly as the sun passes over the equator. Here in the Northern hemisphere we have now entered the ‘dark’ time of the year. M and I held a ceremony at the time of the equinox, conveniently 9.22 on Wednesday morning when we were at home, so we lit candles, rang bells, and I sang some songs celebrating the turning of the Earth. At the moment of the equinox we paused, and then had the rather awe inspiring sight of the candle flames dipping down very small for several seconds, before growing back to full size again. Her delight that something had actually happened was very touching. However I also have to remember what autumn is all about. Getting the harvest in for the winter, making sure it is safely stored away so that we will not starve in the months ahead. 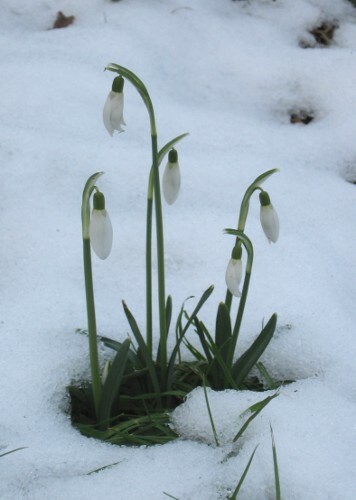 Animals retreat into hibernation, plants retreat below ground. They are busy resting, building, growing in ways that we cannot see but that will bear fruit in the light half of the year. I need to look after myself more, sleep more, keep warmer and eat more sustaining or starchy foods than I do in summer – root vegetables instead of salads. This should be a time for dreams. Dreams need time, and even dark to grow, before they can manifest in their full glory. Luckily there is one cycle I began during the summer months which has reached the active stage this week – that of my garden redesign. As the grass ceases its growth, it is time to mark out the new paths so that digging may commence. That will be a great job to do in winter! Last weekend was the pagan harvest festival of Lughnasadh, or Lammas if you prefer. It celebrates primarily the grain harvest, used for making the staples of beer and bread. Once upon a time people were more aware of how all is conscious and alive and contains spirit. The corn (grain) spirit was one of the most important not only because it was such an essential part of the diet, but because barley, oats, rye, spelt, wheat etc were all annual plants. It would be a disaster if the corn spirit died over the winter, so a figure or other vessel was made and kept for the corn spirit to live in, which could then be returned to the ground in the Spring to help the new crop grow. Some areas have developed their own particular styles or shapes, which may have their own particular significance. 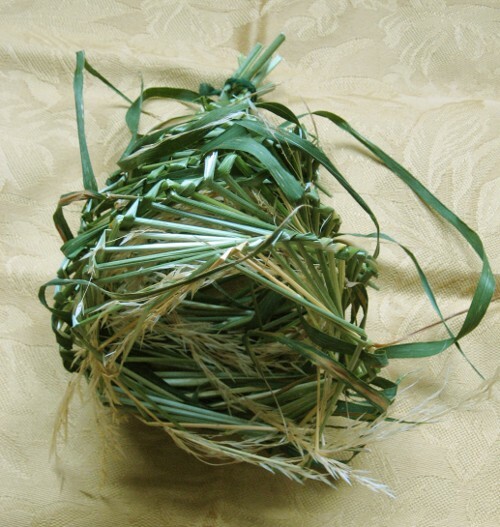 What you see here is made from four foot long fresh grass stems cut from beside my hedge, woven into shape, and then dried out. (I did not wish to photograph the corn dolly for several days after I made it.) It is not as strong as one made from stems that are already dried, because they have shrunk slightly, but it did not require soaking to bend them into position so was doable in the time available to me. It serves its purpose. And later I will return it to the hedge. The standard pagan calendar of eight sabbats sets out two of them for harvest – the grain at Lammas / Lughnasa at the beginning of August, and the tree fruit at the Autumn Equinox. I have particularly noticed this year how by August most of my soft fruit picking will be finished, that which started in June shortly before the summer solstice. Right now I am spending a good hour of every day picking fruit – strawberries, alpine strawberries, loganberries, raspberries, black, red and white currants, gooseberries, morello cherries… Not all get done every day, and luckily the blackcurrants finish before the gooseberries start, but I am still picking around four or five types of berries a day for several weeks, on top of any vegetables. I then spend more time in the evening ensuring that those we don’t eat or cook immediately get stored in the freezer whole or as purée to be turned into ice-cream, or as jam or jelly. Apart from strawberries, few of these fruits get a mention in any book of festivals, pagan or otherwise such as the many Steiner-Waldorf books for celebrating with children. So why is this amazing bounty almost completely overlooked in the yearly cycle? Two reasons I suspect currants in particular have failed to gain much popularity is that first they don’t really grow wild, and second you wouldn’t want to eat many raw berries. They are much better cooked! They are also small and insubstantial individually; it takes a lot of berries to make even a sauce or condiment for a meal. This is quite unlike pome and larger stone fruit where one fruit is satisfying by itself, picked and eaten raw off the bush. Neither do currants travel well; a handful of berries is never going to be as sustaining as a pocket full of apples over a few days of walking. So they have never entered our folklore. However I do not see these as reasons to ignore them. Their flavour and colour is so much more intense than most other fruit that a little goes a long way. They crop better than imported ‘superfoods’, contain at least an equal amount of antioxidants, and blackcurrants contain a very high amount of vitamin C; during the 1940s blackcurrant syrup was distributed free to young children when oranges became unavailable. Even today 95% of blackcurrants in England get turned into Ribena apparently. It’s March, the sun is shining, for some reason I have a great need to be ‘doing’ things. I started in the garden, where the second priority (after planting the first seeds of the year) was the removal of last year’s dead stems as the new shoots start poking up out of the ground. I made a huge pile of stuff to shred, which yesterday was all turned into the first compost of the year in the tumbler. Then having got into ‘clearance mode’, enjoying all that space and potential and light that enters, I find myself looking at the house to see where the greatest need is for a major sort out and clearing. I’m not like Mole who says “Hang Spring cleaning!” and runs off to the river with Ratty – this is about the only time of year when I manage proper cleaning! Spring Cleaning has a long history, with various commentators linking it to the Persian New Year, the Jewish Passover, Christian Lent, or even Scottish Hogmanay – although the latter feels a little early to me! For those with a very strong tradition of celebrating particular festivals then it is a great focus to get the work finished and decorate in honour of the event. I see Yule a bit like this, when I put up decorations, and then clear them away as the days lengthen – but other decorations tend to be rather lower key so Spring Cleaning is to me a seasonal exercise not a religious one. There are of course the practical aspects as to why Spring Cleaning in particular is so widespread. It is good to clean when it is warm enough to open all the windows and doors and dry the inevitable mounds of washing, but not be into insect season yet. In days gone by the extra light may have brought to people’s attention the amount of mud that had been tracked in during the winter months, or blackness from the smoke from the tallow candles on the walls. As a Pagan, cleaning acts as a cleansing, to clear out old, stale energies and make space for something new to happen. It happens on many levels – in an ideal world cleaning should be on the energetic and astral planes as well as the physical planes, as then real change can happen. By that I mean that not just the physical dust and dirt is removed, but any negative thought forms are left with no space to hide, and order is brought to whatever chaos resides in the area. A new mindset can be brought about as well, which leads to further positive changes in our lives. This year a long-planned major house project has affected my sewing area – thanks to having to move things out in order to plaster the wall. (Hooray!) However, I am amazed at how many ‘useful’ scraps of fabric I seem to have accumulated in just a few months, all of which need to find homes before they become scrumpled and dusty. I found I had three bags of worn out clothing or sheets for making mock-ups for new patterns. 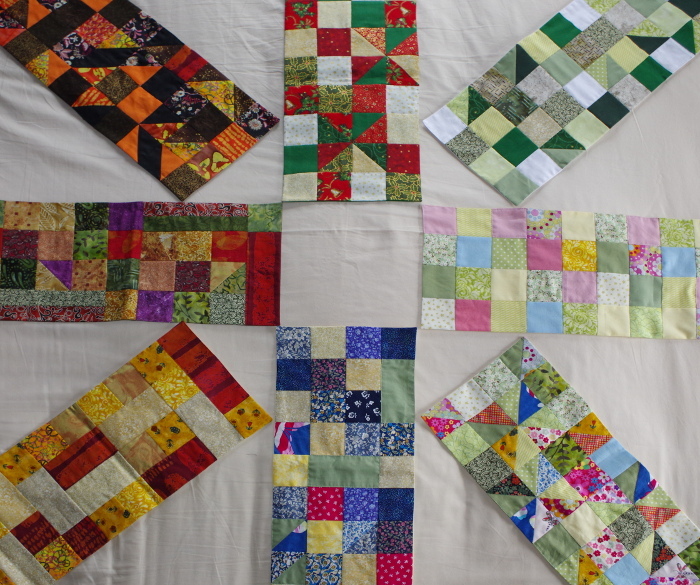 Then I have to keep all those sharp pointy sewing tools out of M’s reach – and more rearrangement needed as the tall chest of drawers moves rooms. I of course always have far too much stuff and not enough space to store it, so sometimes I do actually have to get rid of things. I try to leave myself open to guidance here so that I will not get rid of anything I will want – and put the pile in another room for a week in case there is anything to retrieve before it goes in the dustbin or charity bags. (On this occasion most of the worn out clothes were seized upon and ripped up for oiling and polishing rags by a certain model engineer before they had even made it into another room…) And this year various other bags to be carefully labelled and put in the loft while we get the plastering done. It all takes time and involves washing, dusting, hoovering, sorting, and lots of hard physical work keeping me warm enough to throw the windows open. And the net result? Old projects are properly packed away and laid to rest, and space for new ones has been made. I can find things, I have space to turn around and to breathe, and the whole area feels enlivened. My efforts feel worthwhile. Now can I please have a second chest of drawers to put the rest of my fabric in? 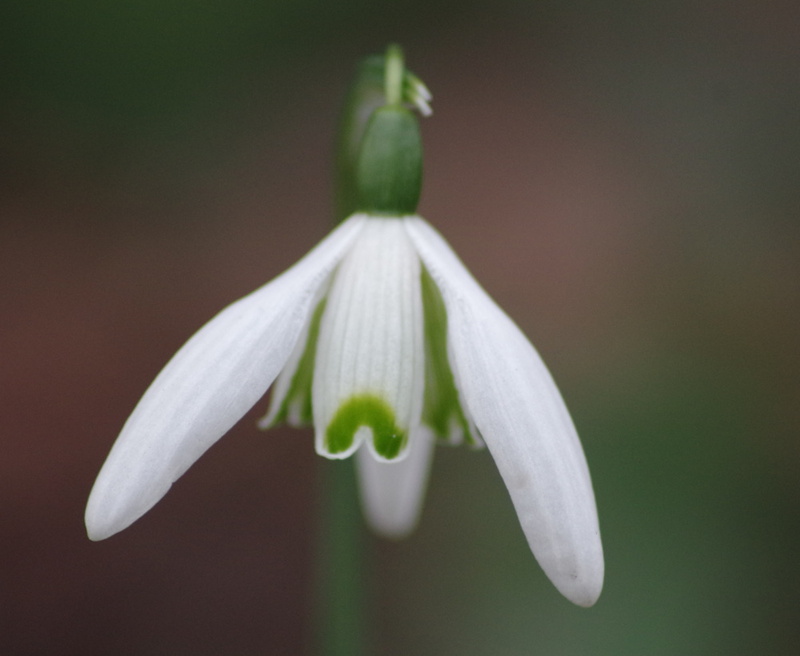 Last Sunday was Imbolc, the first festival of Spring marking the transition into the active time of the year. The word means Ewe’s milk, because in days of old the first lambs were born and there would be milk to drink again. New life emerges, even as winter temperatures continue. Celebrating the Sabbats has become a large part of the modern pagan tradition. I have written before here how, besides giving me something to celebrate every few weeks, I enjoy their connecting me to the cycles and rhythms of the natural world and to the gods and goddesses of the land. However I sometimes wonder whether they are relevant to me as a witch (rather than just as a pagan) since if I want to make changes in my life the moon is the celestial body I am more likely to work with. 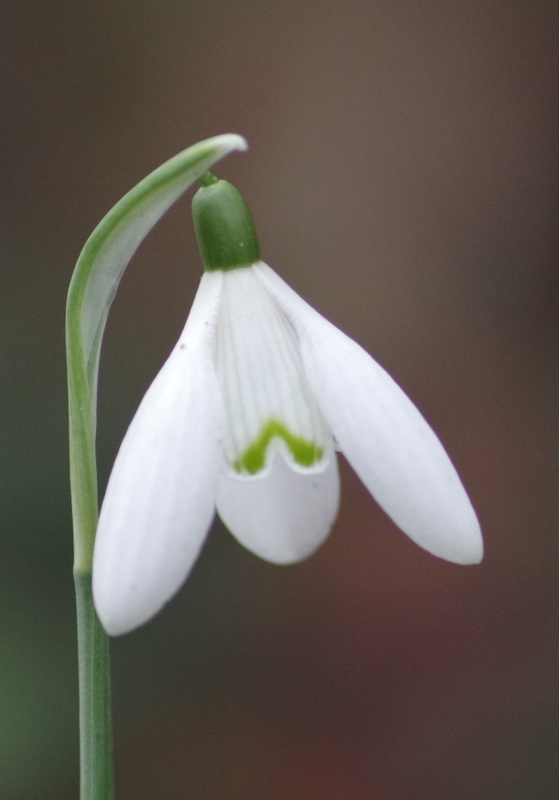 So this Imbolc I was pleased to have reason for a special ceremony in the garden. Imbolc celebrates the reigniting of the divine spark, bringing our intuitive, unconscious energies into a manifest conscious reality that may grow as the sun’s power grows. This is all on a much bigger scale than the 29-day moon cycles. Candles are lit to symbolise the divine spark of the returning light – and act as a focus for our inspiration, creativity and intuition. Some years I have needed to symbolically relight my own internal fire from this candle, if I have been struggling through a long, dark winter, although I’m glad to say I didn’t feel such a need on this occasion. I made a cross for Brigid, the keeper of the light, because Imbolc is really her festival. We lit three beeswax candles to stand by her cross in the evening, representing her three aspects of inspiration, healing and smithcraft. Then the next day I took the cross into the garden and had a small ceremony to announce my intentions for each of the three main areas of the garden and ask for the help of the nature spirits to work in partnership with me. It was then placed under the Rowan tree, an area I have promised to leave as undisturbed as possible. Celebrating the sabbats gives a focus to the seasons for me, and I like to mark them all in some way because they add meaning to my life. They are always high points, coming at random mid-week and interrupting routines. Yule is the biggest and the only one with significant preparations well in advance of the day. However, this year even more than previously I have been asking myself what preparations do I want to do as a pagan? What will add meaning for me, rather than just going along with what everyone else does? 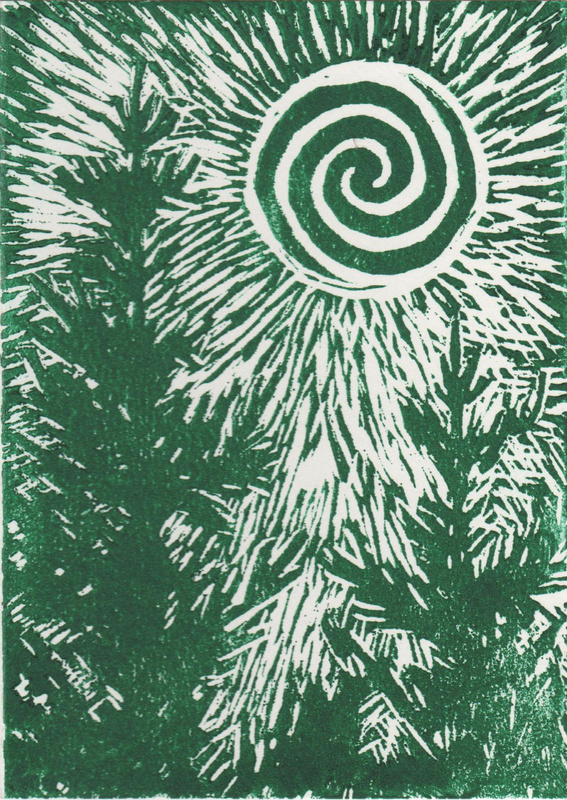 The Winter Solstice does of course celebrate the return of the light. This can be interpreted in many ways, including the birth of the sun god. Mithras, Sol Invictus, or Jesus, whichever sun god you prefer to celebrate. So I have been making a gold star for the top of our tree (not finished yet! ), and hung many gold decorations. Dried orange slices, or clove oranges are also great decorations that I would love to do in a future year. The tree being evergreen represents everlasting life, and brings warmth and protection to the household through the darkest days. I will keep the decorated tree until the mornings finally start getting lighter around 5th January, long after the shortest afternoon. We have had a “December candle” for the first time this year, burning for 45 minutes each dinner. This provoked an interesting discussion with a friend who is an Anthroposophist, who after some thought said she felt everything should be building up to the birth of Christ, not decreasing. 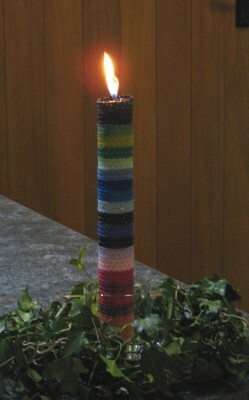 She liked the Advent wreaths in which an increasing number of candles are lit each week. However I feel that our candle represents the diminishing sunlight, which then returns when we reach the big event on the Solstice. (Our celebrations involve getting up to see the sunrise, and then sharing gifts after that. Yes we open ours a few days before everyone else…) The candle is surrounded by an ivy ring, which fits with Yule meaning wheel. The year is at its turning point, and is a time of rebirth and transformation. The light returns, and all is renewed to grow again. Feasting is a major part of Yule, because when it is dark and cold outside we need suitably warming and sustaining food, for our spirits as well as our physical bodies. We have lost the natural rhythms to our lives over the past century or so; before the electronic age most people would have spent Winter evenings around a fireside, entertaining each other by whatever means they felt suited to and generally resting instead of working outdoors until late at night. Storytelling and singing was popular, as well as other forms of communal entertainment. Today illness frequently forces us to rest. But the return of the sun gives an extra reason to celebrate and have a bigger or fancier meal than every day, with decorations and joyous feasts to welcome it back. The winter may be far from over, but the light is increasing again each day. However there is one aspect which has puzzled me for a while now. There are various chambered cairns in the rocky parts of our islands, thought by some to have been used for shamanic practices such as initiations or retreats or communications with ancestors, since most contain very few actual remains. Some are carefully aligned to the Winter Solstice, so that the sun enters only on a few days each year in midwinter – bringing light to what is otherwise a perpetually dark space. A famous example is Newgrange in Ireland. But Maeshowe in Orkney, or Clava Cairns near Nairn are both aligned to the setting sun, rather than to the rebirth in the morning. So what exactly were our ancestors celebrating, and what form did these celebrations take?